Development of airport infrastructure that can support growth, accommodate technology change and meet tight environmental criteria is vital if the industry is going to meet soaring demand forecasts. By Bernadette Ballantyne. For decades the global aviation industry has enjoyed sustained growth, with economic development, globalisation and liberalisation fuelling a demand for greater capacity and connectivity. New technologies, far from replacing the need to travel, encourage greater international connectivity between people and business – providing new reasons to travel. 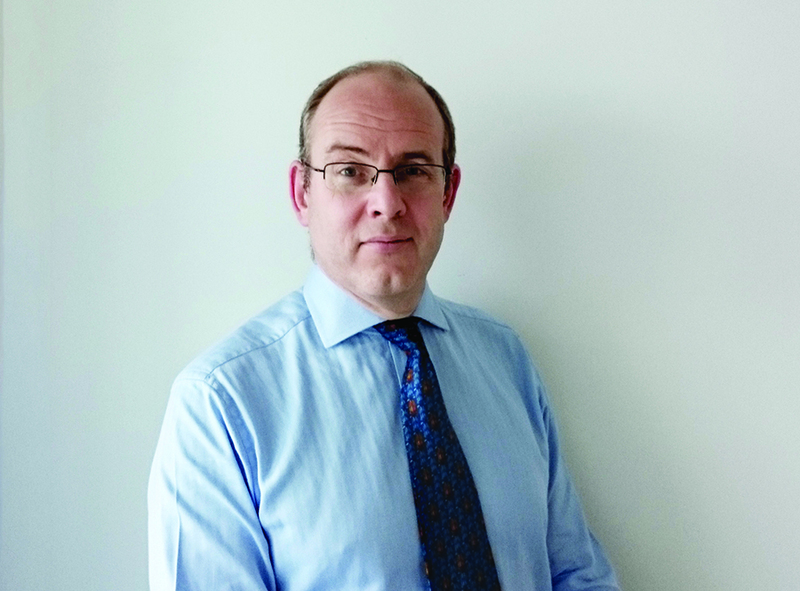 “Aviation is a sector that has continued to grow for at least the past 40 years, and all forecasts indicate that it will continue to expand at a healthy rate across all regions for the foreseeable future,” says Graham Bolton, aviation director at Atkins. In fact the International Air Transport Association (IATA) predicts that demand will more than double by 2034, resulting in some 7.3 billion global air passenger journeys made every year, compared to 3.3 billion today. “History shows good correlation between growth in aviation and GDP, so as people and economies become more successful, aviation expands,” says Bolton. Through enabling the effective movement of goods and people, aviation itself is seen as a significant enabler of growth, with the US Federal Aviation Authority in 2014 identifying that aviation contributed 5.4 per cent to US GDP. Although events such as the outbreak of SARS and the terrorist events of 9/11 have interrupted growth, the industry has always rebounded. “We see occasional blips from political or environmental events, but what is really interesting is that every time there has been a blip passenger numbers have recovered quickly,” says Bolton. Developing infrastructure in response to this increasing demand involves a complex balancing act between the needs of airlines, airport owners, passengers and local communities. Changes in airframe and engine technology, which significantly reduce noise and fuel burn, help to reduce the impact of aviation, but need to be accompanied by improvements in surface access, operational efficiency and environmental performance of facilities. What makes a good airport? With differences in local context and user needs between individual airports, there is rarely an off-the-shelf solution to infrastructure provision. 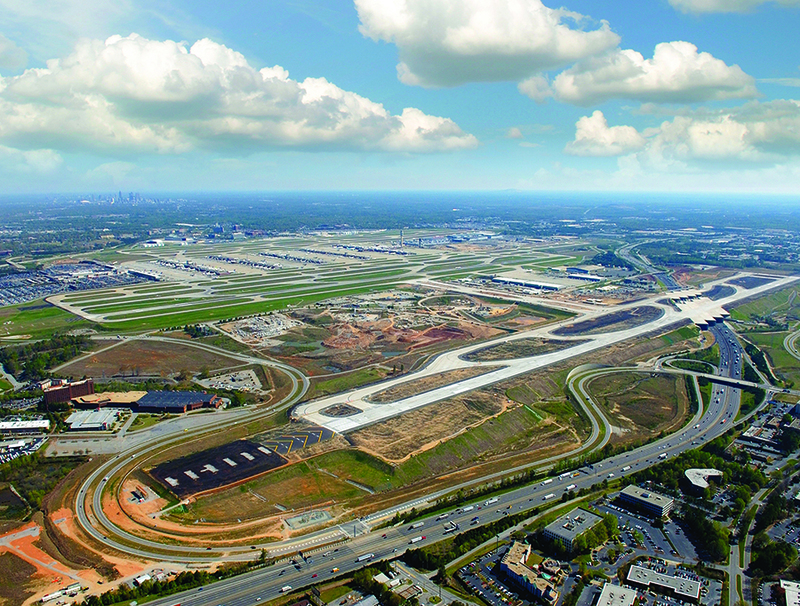 “There are different solutions that reflect the mix of passengers, airlines and travel patterns,” says Bolton, pointing to the difference between Atlanta, where Atkins undertook design and construction management for a fifth runway, and London Heathrow. “Atlanta has high levels of domestic traffic, whereas the majority of traffic at Heathrow is international. Both are hub airports but they have very different operations,” he says. Expansion of Heathrow Airport is currently being considered by the UK Government following the publication of a long awaited review of UK airport capacity on 1st July. The UK Airports Commission concluded that that there was a strong economic argument for expansion of airports capacity in the South East, and unanimously recommended the development of a new runway at Heathrow. However it said that this would need to be combined with a significant package of measures to address its environmental and community impacts covering noise issues, air quality and community engagement. 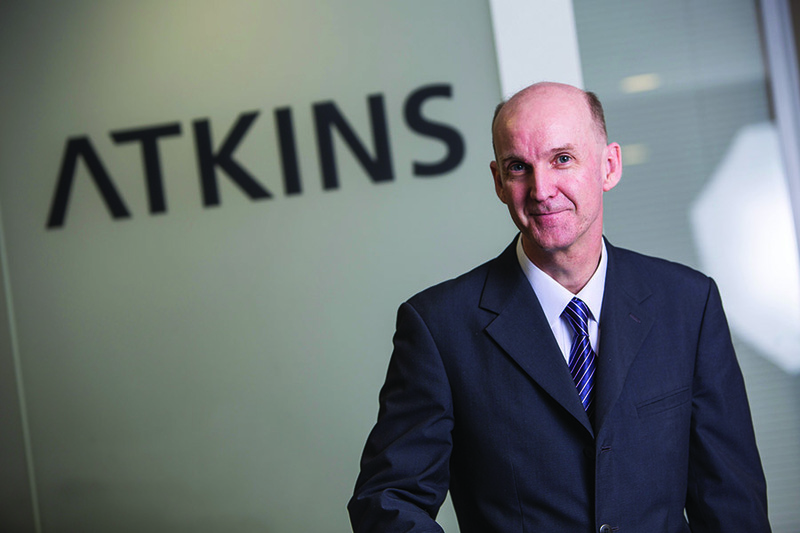 Having supported the Airport Authority in the development and subsequent expansion of the airport since the early 1990s, Atkins was well placed to work on the preparation of the EIA in association with other consultants. An environmental permit was subsequently granted and ensuring that the construction meets with the conditions and recommendations in the permit will lead to some innovative construction techniques being used, which will ensure preservation of ocean habitats and the protection of the environment. “There are a lot of techniques that will be used for construction that have not been used at this scale anywhere in the world. One of the environmental constraints is that there can be no dredging of the soft deposits of the sea bed,” says Creally. Therefore the use of non-dredge methods such as deep cement mixing to create grout columns that will stabilise the sea bed has been specified. Horizontal directional drilling will be used for the diversion of two existing aviation fuel supply pipes that are located below the land formation. This method sees installation carried out from the surface effectively pushing the diversion pipes deep into the bedrock without needing to disturb the marine environment of the sea bed. With an overall length of about 5km this will be a record breaking distance for the use of this method. 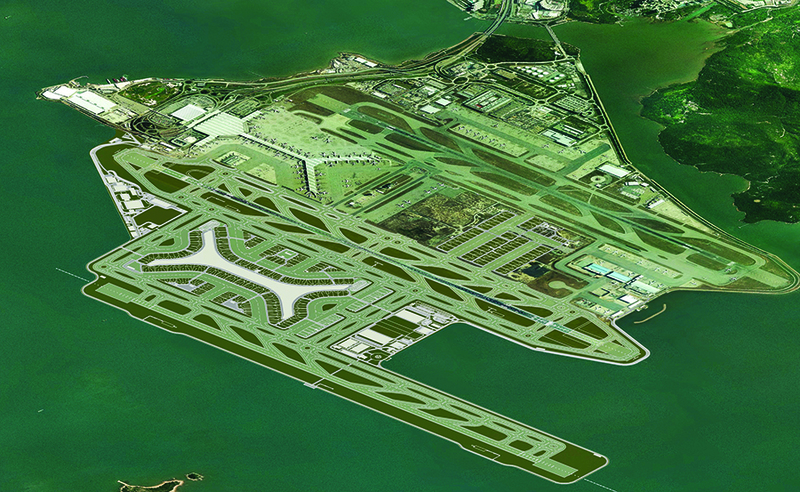 Construction of the three-runway system is a vital step for Hong Kong, which has seen passenger demand rise by over 120 per cent since it opened in 1998. In the first year 28.6 million passengers used the airport, but by 2014 it had risen to 63.3 million, placing it firmly in the world’s top ten. By 2030 the Airport Authority expects to see demand for 100 million passengers, which could only be met with a third runway. Based on these traffic projections, the expanded airport is expected to contribute HK$184 billion (in 2012 dollars) to local GDP every year, almost twice the 2012 contribution of HK$94 billion at the existing facility. “We determined that a new terminal would be far better from an operational and capital cost expenditure basis than upgrading existing facilities"
Such traffic growth is not unusual for Asian markets, with data from IATA indicating that passenger traffic in China alone will grow at 5.5 per cent per annum, a rate likely to be at least matched by other developing economies. Even in more mature markets, the impact of growth will be significant, with annual traffic in the US expected to have increased by over 500 million passengers by 2034. In anticipation of this major growth, airports across the country are reviewing their facilities and discussions are ongoing at government level regarding the funding of expansion projects. One of the methods under consideration is the removal of a cap on passenger facility charges, currently a maximum of $4.50 per passenger. However some airports are moving ahead with their investment plans. In the south of the country Atkins is designing a new 30 gate international terminal at the Louis Armstrong New Orleans International Airport. 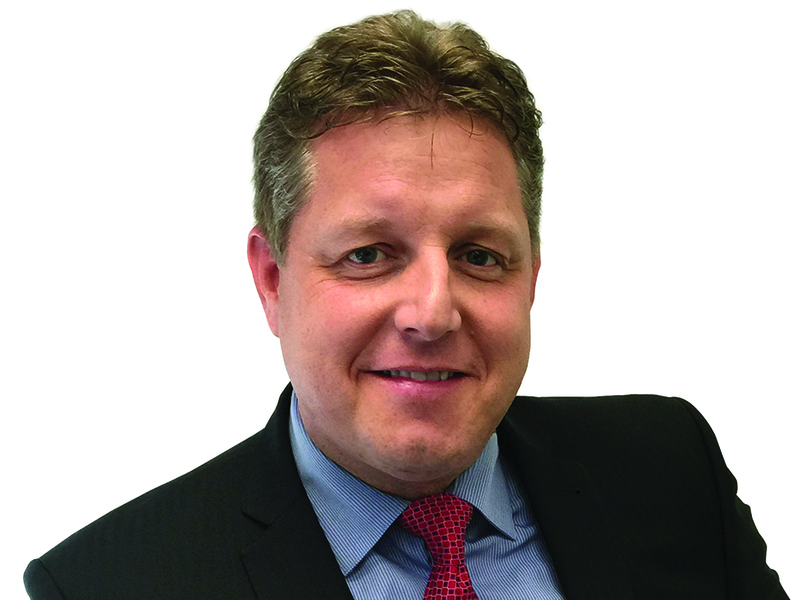 “We assessed the existing facilities, looked at anticipated usage and needs of the airlines, and in coordination with the airport and other consulting teams we established the business case for a solution that would best suit the airport’s development,” explains Justin Jones, senior vice president of Atkins’ aviation business in North America. “We determined that a new terminal would be far better from an operational and capital cost expenditure basis than upgrading existing facilities - and having done the planning and the site selection we are now designing the new terminal,” he continues. Construction of the project is due for completion in 2018. As well as expansion schemes, airports in the US are also looking to improve return on investment and performance of their facilities. “Airports have a lot of information that they are not currently using, so the more sophisticated airports are looking at that to improve asset management, enhance energy efficiency and reduce operational expenditure,” says Jones, explaining that Atkins’ experience on airports all over the world means that the firm can share international best practice in these areas with its clients. At the same time demand for new services like this is seeing the firm grow and diversify its work in the sector. “The important thing is that infrastructure has to have the flexibility to accommodate technology, process and regulatory change – without increasing up-front investment."